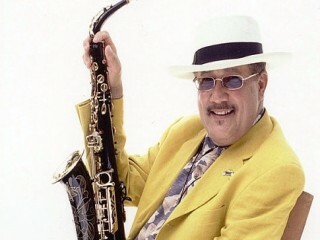 Paquito D'Rivera is a Cuban alto saxophonist, clarinetist and soprano saxophonist. A child prodigy, he got a head start from his father, Tito D'Rivera, a well-regarded classical saxophonist and conductor. His father taught D'Rivera to play classical music and jazz with equal ease--the elder D'Rivera was comfortable in both genres, as his young son would later become. In 2005, D'Rivera wrote a letter criticizing musician Carlos Santana for his decision to wear a t-shirt with the image of Che Guevara on it to the 2005 Academy Awards, citing Guevara's role in the execution of counter-revolutionaries in Cuba, including his own cousin. D'Rivera was a judge for the 5th and 8th annual Independent Music Awards to support independent artists. -Live at the Keystone Korner CBS, 1983. -(Contributor) Le Quatuor de Saxophones (Gerald Danovitch Saxophone Quartet), CBC, 1987. -Return to Ipanema Town Cryer, 1989. -(Contributor) Autumn Leaves--Severi Comes (Severi Pyysalo), Selecta, 1989. -(Contributor) Live at Royal Festival Hall (Dizzy Gillespie and the United Nations Orchestra), Mesa/Blue Moon, 1990. -(Contributor) Live at Birdland (Claudio Roditi), Candid, 1990. -(Contributor) La Habana-Rio Conexión Messidor, 1992. -Paquito D'Rivera Presents 40 Years of Cuban Jam Sessions Messidor, 1993. -A Night in Englewood Messidor, 1993. -Achango's Dance (Caribbean Jazz Project), Heads Up International, 1995. -Portraits of Cuba Chesky, 1996. -(Contributor) Cuban Jazz RMM, 1996. -(Contributor) Island Stories (Caribbean Jazz Project), Heads Up International, 1997. -Paquito D'Rivera: Chamber Music from the South Mix House, 1997. -Paquito D'Rivera and the United Nations Orchestra Live at MCG Blue Jackel, 1997. -(Contributor) For Winds (Robert Baksa), Newport Classic, 1997. -100 Years of Latin Love Songs Heads Up International, 1998. -Paquito D'Rivera Quintet Live at the Blue Note Half Note, 2000. -(Contributor) Danzon (Turtle Island String Quartet), Koch International, 2001. -(Contributor) The Commission Project (American Saxophone Quartet with Paquito D'Rivera), Sons of Sound, 2002. -The Best of Paquito D'Rivera Legacy/Sony, 2002. -Brazilian Dreams Manchester Craftmen's Guild, 2002. -Historia del Soldado Karonte, 2002. -Big Band Time Timba, 2002.